Missy J's - Get Involved. Make Friends. Enjoy Motherhood. 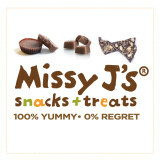 Missy J’s snacks + treats, Boulder’s only natural candy store and factory, offers an array of healthier treats made to satisfy a sweet tooth without compromising taste or health. Missy J’s is 100% yummy with 0% regret. Missy J’s, products are free from dairy, caffeine, white or cane sugar and use nutrient dense ingredients such as carob, coconut oil, almonds just to name a few. Our mission is to offer “better for you” treats + snacks where customers can indulge happily and more naturally. In addition to the Missy J’s brand, the store also sells other locally produced and nationally recognized healthier brands such as, Suncups, Olomomo, Cocomels, Little Secrets, Veggie Gos, Appleooz and Cows gone dairy free ice cream.